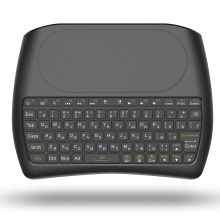 This is a Russian & English version of 2.4GHz wireless mini QWERTY keyboard and Touchpad combo, with USB interface receiver. Plug and play, simple and smooth. The 7-color backlight makes it available at dark. Easy to operate the left mouse key, right mouse key, and rolling screen. Supports touchpad DPI adjustable functions, better matching different sizes of screen. The mini keyboard ensures convenient typing, and you can control your devices on your couch. Compatible with PC, notebook, laptop, Smart TV, Android TV Box, etc. The Ergonomically handheld design is easy to carry and operate. Multifunctional combo: Wireless mini keyboard and touchpad mouse, 2 in 1 smart combo. The 7-color backlight makes it available at dark. 2.4GHz Wireless Connection: With included USB interface adapter, no driver needed, plug and play. 2.4GHz wireless connection, enjoy up to 10 meters wireless control. High Sensitive Touchpad: Easy to operate the left mouse key, right mouse key, and rolling screen. Supports touchpad DPI adjustable functions, better matching different sizes of screen. 79 Keys Keyboard: The mini keyboard ensures convenient typing with 79 keys, and you can control your devices on your couch. Strong Compatibility: Compatible with PC, notebook, laptop, Smart TV, Android TV Box, etc. The Ergonomically handheld design is easy to carry and operate. Note: For Smart TV or Smart Projector users, before purchasing, please make sure that your TV or Projector can be connected to a mouse or keyboard and use normally (can test using a mouse).